We offer dining facilities for all occasions. Our membership enjoys formal entertaining in the Dining Room, a relaxed time in the Grill and hosts special events in the Grand Ballroom or one of our 9 private dining rooms. Beverage service can be enjoyed in the Bar, Reading Room and on special occasion, in the Library. The Pendennis is proud of its private label bourbon and on the first Saturday in May, serves countless secret-recipe mint juleps to many of our two thousand Kentucky Derby guests. Then there is the Rathskeller. This dining room is used upon request and offers elegant privacy. 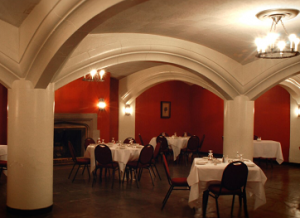 Located on the lower level of the Club, the Rathskeller hosts private functions and Club functions throughout the year. The fireplace is one of the grandest of scale in the Club, and like the others still boasts a wood fire in the winter months. The Club offers services six days a week and closes only a few days out of the year to offer every opportunity to enjoy its services. 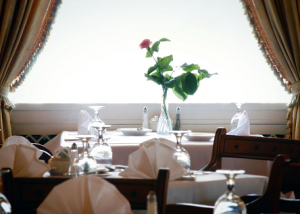 Our membership enjoys experiences ranging from relaxed time in the Grill to formal dining in the Main Dining Room. For special occasions we proudly offer the Grand Ballroom or one of our nine private dining rooms. If you require an intimate dinner or a grand affair for 500, The Pendennis stands ready to accommodate your event. And for the first Saturday in May, all bets are on that everyone will have the most enjoyable time at the club. The club offers two squash courts, fitness equipment and weights, steam, sauna, massage by appointment as well as athletic area dining. 218 West Muhammad Ali Blvd. ©2017 pendennis club. All Rights Reserved. Website by Honeywick.